Popcorn machines can have a place in more than just movie theaters. They can be a fun addition to kitchen equipment in any venue. Not only are they decorative, they also bring consumers back to thoughts of childhood carnivals and movie outings, winning them over with nostalgia. Beyond bringing back childhood memories, popcorn also happens to be typically inexpensive for venues and consumers. To top off the attractiveness of this snack, dessert, or garnish, popcorn (without toppings) is low in calories, making it appealing to health-conscious customers. 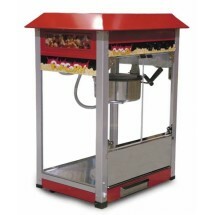 When choosing a popcorn machine, venues should consider their purpose in buying the machine. If it is for decoration, an authentic looking machine is best. If it is for both display and mass production, the larger and more powerful the machine, the better. However, if a chef wants to use gourmet popcorn in desserts and as a way to make dishes unusual, then compact popcorn machines are the best option, since only small quantities will need to be prepared. Product Name Omcan VBG802 Popcorn Machine Paragon 1108910 Original 1911 Popcorn Machine 8 Oz. Paragon 1120810 Classic Pop Popcorn Machine 20 Oz. Paragon 1106710 Professional Series Popcorn Machine 6 Oz. Size Kettle holds 8 oz. Kettle holds 8 oz. Kettle holds 20 oz. Kettle holds 6 oz. Comments This popcorn machine is useful for small-scale, gourmet popcorn preparation in venues that are looking for aesthetic equipment, such as those that offer chef’s table meals or those catering events and looking for unusual ways to spruce up their plating and dishes. 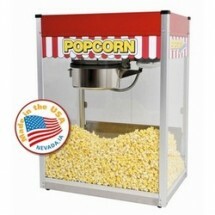 This popcorn machine is relatively strong and has a great warranty. 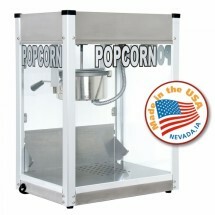 Businesses looking to add popcorn machines to their spread when catering events may find this a good option. 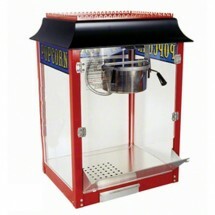 This heavy-duty popcorn machine allows for mass popcorn production, making it an ideal option for carnivals, catering events, and movie theaters. This is a relatively basic popcorn machine, on the same scale as the Food Machinery of America popcorn machine described here. Though the kettle holds less than the Food Machinery of America machine, the longer warranty may make this machine the best option for food businesses looking for kitchen equipment to produce gourmet popcorn in-house or while catering events.